Brands are realising that as we live in a multi screen world we need to cater for mobile users more and more. And it’s not just making sure you have a mobile optimised website, recent research from Adobe Digital shows that users of apps are more brand loyal. New data from Adobe Digital Index measures engagement on apps versus the Web on a sample of more than 600 brands which should make this message clear for marketers. According to the data, building a mobile app is a worthy investment because users of mobile apps are more loyal to the brand versus those who just visit the Web site from their mobile devices. 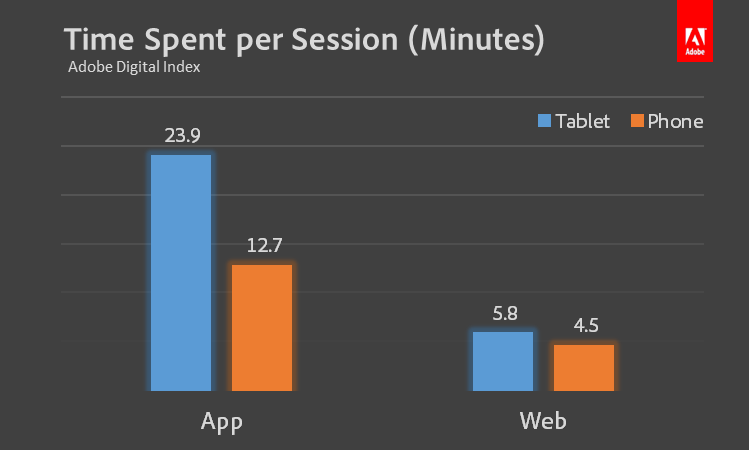 Tablet users spend the better part of a half hour (24 minutes) in an app session, while smartphone sessions are much shorter at nearly 13 minutes. Compared to those browsing Web sites, however, the app sessions are three to four times longer. Consumers use the average smartphone apps more than twice as often as they visit the typical mobile Web site. All combined, the app usage outpaces mobile Web visits by an average of 100 minutes per month.